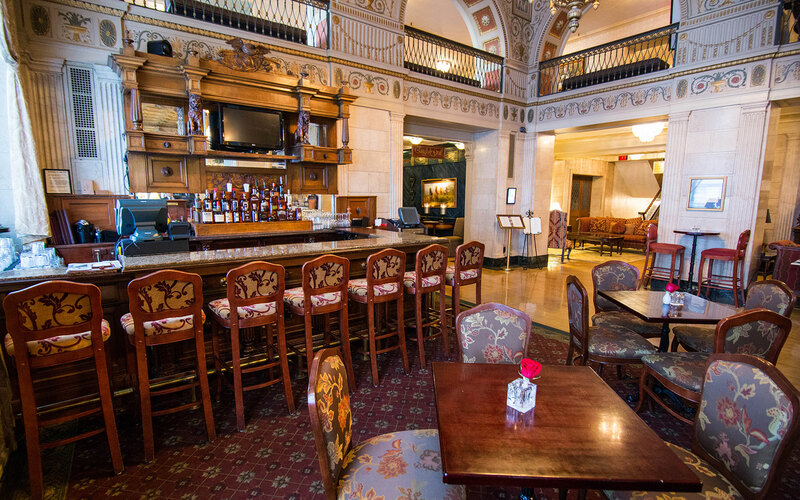 The Brown Hotel | Louisville, KY: The elegant and traditional Brown Hotel is a Louisville legend. With arched windows and towering pillars topped with gold leaf and scrolling accents, the lobby alone is worth a visit. Book their Muhammad Ali suite to pay homage to the famous Louisville native, or take a drive five miles to see the Stitzel Weller Distillery. The check-in desk at the ALoft Newport on the Levee. 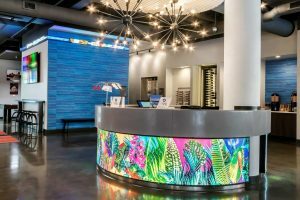 ALoft Newport on the Levee | Newport, KY: The ALoft embraces an industrial-chic look with poured concrete floors and exposed ducts, interspersed with pops of neon light and soft white beds. This all-new hotel is a modern beauty, with Bourbon touches like Four Roses soap dispensers and barrel wood sinks. Each stay comes with cocktails at their stylish bar (Instagram approved). Waking up at ALoft couldn’t be easier. A five minute walk will take you to Newberry Bros. Coffee, an independent roastery that also just happens to have a selection of 1,500 Bourbons, whiskeys, and ryes. Or, mix up a day of brown water and spend some time with those in fresh water. Newport Aquarium has 70 exhibits and an opportunity to get up close and personal with penguins, sharks, and more. Louisville Marriott East | Louisville, KY: As the official hotel of the Kentucky Bourbon Trail, as well as a stop on the Urban Bourbon Trail, the Louisville Marriot East sets high expectations – and achieves them. Their rooms are drenched in Bourbon-hued carpets, bedding, and more, and deep red walls with a show-stopping stained glass chandelier greet incoming guests in the lobby. Dine at Charr’d Bourbon Kitchen, on our list of America’s Best Bourbon Bars, or take a ride down the Kentucky River on the Belle of Louisville. Need to do a little (or fine, a lot) of work on your trip to Bourbon Country? Plan a meeting in the Bourbon Boardroom, where vintage labels adorn the walls. Pin and Proof Speakeasy Bowling Alley at the Omni Louisville. The Omni Hotel | Louisville, KY: Louisville’s newest luxury hotel has room (and dining, amenities, and more) for all. With over six hundred rooms and six on-premise dining options, you’ll never have to leave the hotel. Start with breakfast at Neighborhood Services off the lobby, then stroll through Falls City Market for coffee, fresh pastries, flowers, and more. 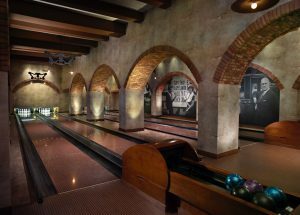 Spend an active afternoon at the speakeasy, Pin and Proof, which takes its name from its four bowling lanes and the classic cocktail menu they serve along with light bites. Then head to the rooftop Water Company bar to quench your thirst poolside before dinner at Bob’s Steak & Chop House. Finish your night at the intimate Library Bar before heading to a room with Kentucky-infused décor and a view of the Louisville Skyline. If you do find the urge to leave the property, The Omni is located near the Louisville Slugger Museum, Angel’s Envy Distillery, Old Forester Distillery, Jim Beam and the Kentucky Peerless Distilling Co. They’re also an official sponsor of the Kentucky Bourbon Trail, and can help you plan a tour of any length through Bourbon Country. The Seelbach Hotel | Louisville, KY: One of Louisville’s oldest and most storied hotels, The Seelbach made its place in Bourbon history years ago with the invention of their signature Seelbach cocktail. Bourbon, bubbles, and bitters make this refreshing concoction the perfect way to celebrate your time as a Bourbon Traveler. Their opulent Fitzgerald suite is a tie to the “Gatsby” author, who used the hotel as inspiration for parts of his classic American novel. Just steps away is Louisville’s Fourth Street Live, which includes celebrity chef Ed Lee’s Whiskey Dry. With Whiskey Row seeing the opening of Old Forester and new tours at Angel’s Envy this summer – you’ll never run out of Bourbon happenings in Louisville. Hilton Downtown Lexington | Lexington, KY: This is what Kentucky is all about – Bourbon, basketball, and horses. Sitting kitty-corner from the Cats Rupp Arena and across the street from Triangle Park in downtown Lexington, the downtown Hilton is steeped in Kentucky’s finest traditions. Walk a block to Bluegrass Tavern, which boasts 700 Bourbons and ryes, or head to Parlay Social, where live music plays while the Bourbon pours. The Hilton is perfect for a special occasion – their celebration package includes champagne and a Bourbon breakfast for two. A quick ride to the Distillery District will take you to James E. Pepper Distillery or Barrel House Distilling, as well as host of restaurants, breweries, and more. Horse Country and Bourbon Country collide at Campbell House in Lexington. Campbell House | Lexington, KY: Just up the road from Red Mile racetrack, a bronze horse greets guests as they walk up to Campbell House in Lexington. Elegant pillars line the portico, while balconies to guest hallways surround a comfortable fireplace seating area in the lobby. The rooms mix modern elegance with classic Antebellum charm – and the hosts have the southern charm to match. Drive just five minutes to downtown Lexington for Bourbon bars like Belle’s Cocktail House, or head to the Town Branch Distillery.